- Press Release, Belize Sailing Association, Tuesday, May 12, 2015 - There is a dawn of a new day for recreational sailing in Belize and hence the Belize Sailing Association (BzSA) new board of directors decided to adopt a logo to embody this excitement of momentum; hence the sunrise coaxing the craft on its voyage forward. This new logo reflects the fact that BzSA is creating international opportunities for our top school-age sailors. In the history of Belize, that is a first. Selection regattas decided which sailors BzSA will send this summer to international events, one for Optimist dinghies and the other for Olympic class Lasers. The International Sailing Federation (ISAF) is to sailing what FIFA is to futbol. This year, ISAF invited and will provide subsidies for Belize and other countries to attend its inaugural Youth Worlds Emerging Nations Program (YW ENP). The initial invitations and help with funding were to enable each country to select a coach, two sailors, and a third providing that it was a girl, to join a Laser training clinic on Antigua, West Indies, the 14th through the 21st of July. The event's purpose is to train a vanguard of emerging nations' sailors and their coaches so that they return home to demonstrate and impart what they have learned to their countrymen - to start a growth in their countries' potential for competing internationally in an Olympic class boat. Just before Easter, BzSA conducted it's own training and a selection regatta, using the Belize Sailing Center's Lasers and its professional coach to decide who to send. 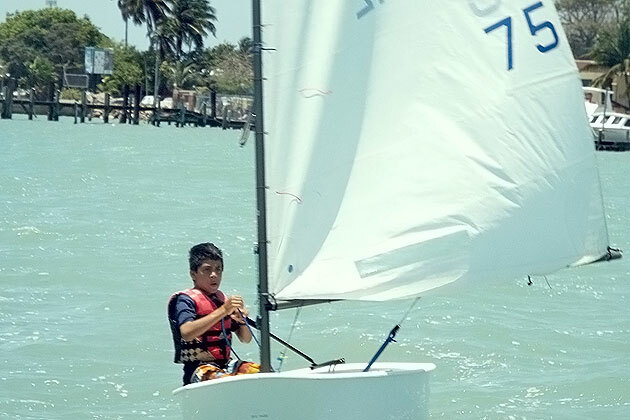 As reported on April 8th, eight of BzSA's top young sailors participated; the three who earned the ISAF invitations were Antonio Ricardez,14, Belize City; Jerdon Anderson, 15, San Pedro; and Blanca Velasquez, 14, San Pedro. These three, and Caye Caulker's Trenton Miller, the coach BzSA selected, were set to be pioneers in the truest sense of the word.
" Due to a higher than expected demand for places on this clinic, your entitlement for ISAF subsidized attendance on this YW ENP clinic is limited only to the persons listed below. - Sailors (2): Blanca Velasquez (F), Antonio Ricardez (M)." In the conversations that followed, every conceivable remedy was explored. It was not about money. The issue is that ISAF will not have sufficient equipment and coaching staff on Antigua to handle the response it got. ISAF's May 7th email further explained that, "The preference from ISAF is to promote gender equality for the YW ENP. All the MNAs (e.g., countries - Member Nation Associations) which have been now told that only two sailors can be put forward have one boy and one girl put forward." On May 9th, BzSA's saddened but undeterred Development Officer, Andy Milner told Jerdon Anderson of ISAF's decision, but he exhorted him and the other Laser sailors present to keep on training hard in anticipation of some upcoming, affordable international Laser regattas, where enrollment will not be limited. Pioneering is also in the immediate future for 3, and probably 4 of Belize's Optimist sailors. 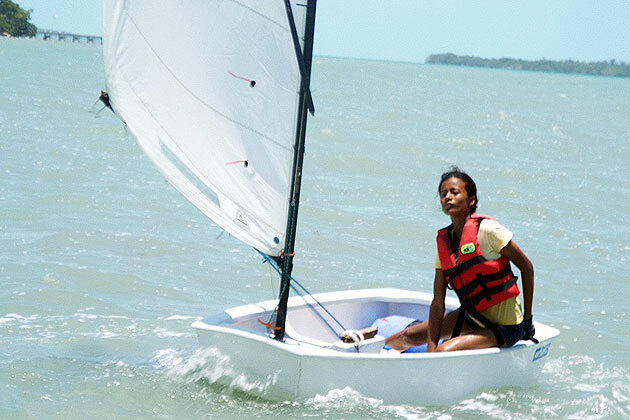 The International Optimist Dinghy Association (IODA) has offered to pay some of the expenses for 3 Belizeans to enter the 2015 Optimist North American Championship Regatta (OPTINAM), on Antigua, 5th - 12th July. Therefore a selection Regatta was held on Saturday April 25th. 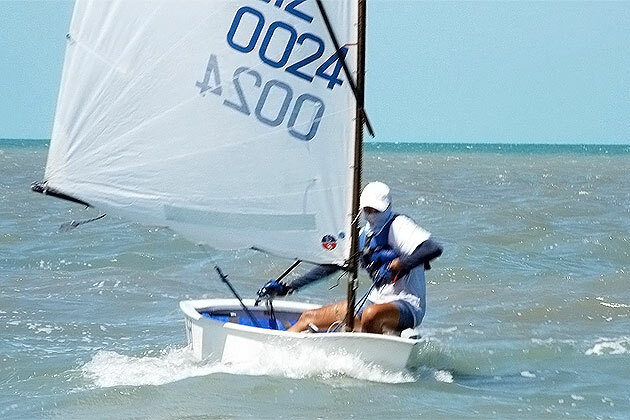 Five of Belize's top Optimist skippers competed in 6 races in the waters off BTL Park in Belize City. 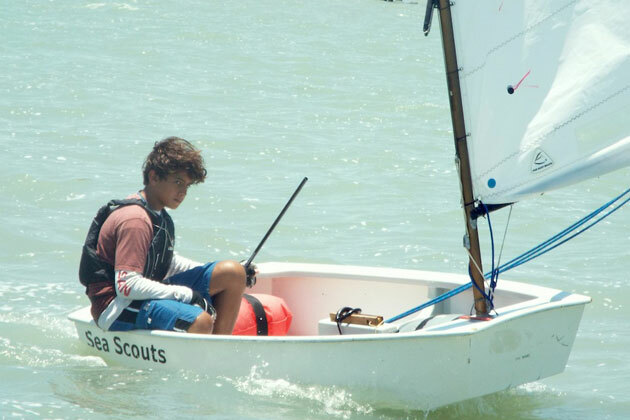 Kevin Velasquez, 13, of San Pedro placed first (Photo 1) in all 6 races, a remarkable feat and a first in the annals of BzSA Optimist regattas. Trent Hardwick, 12 (Photo 2) of Belize City, in determined and stubborn pursuit throughout, came in second. Jasmin Campos, 13, of Corozal (Photo 3) and Nashira Ricardez, 13, of Belize City (Photo 4) posted identical raw scores, but the tie-breaking rule awarded 3rd place to Jasmin. Placencia's Tyler Garbutt, 12, placed 5th. With Kevin, Trent, and Jasmin assured of entry in OPTINAM, BzSA enthusiastically endorses and will spearhead what has become a grass roots campaign here and abroad to raise private funding for Nashira. Just how big is OPTINAM? Well, one report suggested that the 2015 regatta may be so big that it will need to proceed in heats of 80 boats, but the event's web site says IODA will have 175 boats available. Yes, it's a big deal. As yet, no list of all participating countries has been posted; however Canada is sending 10 sailors; Brazil, 15; US Virgin Islands, 4; St Lucia, 4, including a girl. Switzerland, Japan, Singapore, New Zealand, South Africa, Netherlands Antilles., and of course Antigua itself all report that they are entering. No word as yet has come from the USA or Mexico, but the Optimist community expects them. Should Belize be able to send 4 sailors to OPTINAM, Team Belize will then be able to participate in July 9th team racing. "Team racing is the most fun of all events at international regattas" claims Team Belize's coach, Juan Mazzini a veteran of many. BzSA's 2015 pioneering effort in international regattas will be for naught if it cannot both continue and expand. Continued and expanded participation in international championship regattas can in time render sailing in Belize an attraction on par with diving, sport fishing, wild life, and Maya ruins. Hence there will be a payoff. But continuation and expansion require funding. The Belize Sailing Center, Belize Sailing Vacations, Belize Sea Scouts, the Belize Olympic Committee and a handful of private individuals have stepped forward to offer their support in our bid to take our youth sailors to these international events, which are our baby steps towards eventually attending the Olympics. By way of this media, the Belize Sailing Association is humbly seeking financial support in cash or in kind assistance to send our sailors on their way across the Caribbean Sea. For details on how you can help please email us at <[email protected]> or call our Chairwoman Mrs. Sharon Hardwick at tel: 624-8529. You can follow our fundraising efforts on BzSA's facebook page.